Fencing – Our temporary fencing Hire are specifically designed to conform to the Health and Safety Executive Guidelines GS7 (Relating to accidents to children on construction sites). They are manufactured with vertical wires not exceeding 40mm spacing, in order to prevent anyone gaining a foothold in order to climb the fence. Braces are supplied every fifth panel as standard to help secure the line from any wind damage. Vehicle Gates.around can be very inviting to a thief – additionally the site can be a route to break into adjacent properties. Temporary fencing is ideal if you are looking to secure any site perimeter, it’s quick and the most cost effective solution. Temporary security fencing is portable fencing with rubber blocks and clips. 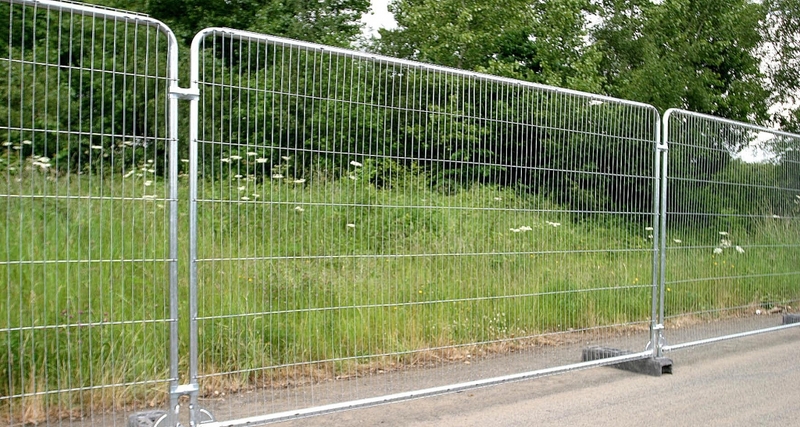 Site fencing is essential for controlled security and keeping the general public at a safe distance whilst continuing any event build programme in safety. Our temporary fencing are specifically designed to conform to the Health and Safety Executive Guidelines GS7 (Relating to accidents to children on construction sites). They are manufactured with vertical wires not exceeding 40mm spacing, in order to prevent anyone gaining a foothold in order to climb the fence. Braces are supplied every five panels as standard to help secure the line from any wind damage. Temporary anti climb fence panels for building sites or Events.